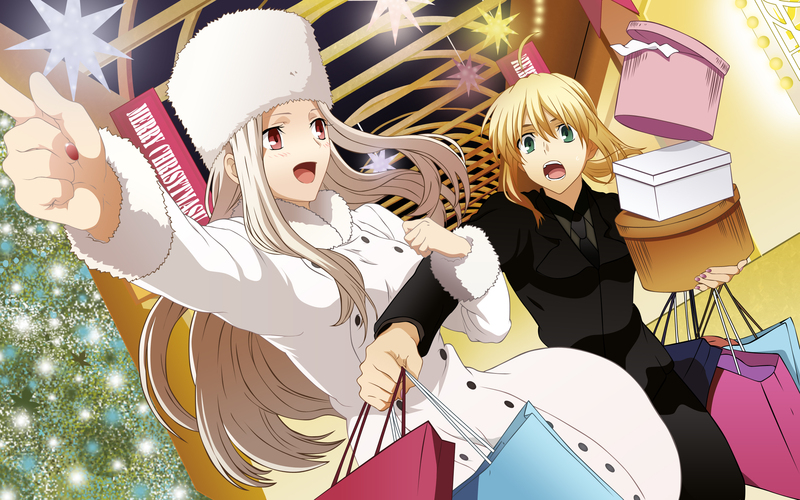 Minitokyo »	Fate/Zero Wallpapers » Fate/Zero Wallpaper: Shopping time! Used this scan Scan to make this wall. Beautiful! but, as you did? Anyways, the vector is fine even though it could be smoother in some places. Also, don't be afraid to use brushes, textures and patterns. The boxes and bags that Saber is carrying look rather plain. Some nice patterns would definitely help make them stand out more. You could also add some fur texture on Irisviel's hat and the fuzzy parts of her coat. Textures make everything look more realistic and less plain. The BG is nicely vectored, too. I'd blur it, though, because it's supposed to be further away from us and unlike the girls, it isn't the focus of the image. Plus, it would also help merge the BG vectors with the blurry Christmas tree(?) on the left. Overall, good job an I'm happy to see you choose some more complicated images to work with, too. Keep it up! I like the christmas tree and the fun/hectic atmosphere in it! Shopping yeah! Reminds me alot of myself and my sis or when my father went shopping with us lol! Nicely done. Though I have to say: Poor Saber! The only thing I do not like is Irisviel nail polish!